I hope you all enjoyed World Card Making Day last Saturday! I'm sorry I missed that! This is actually a scheduled post. As you're reading this I will still be at my sister's house packing, cleaning, or drinking. Prolly all three at once. I'm pretty sure my kegels will be shot by now from trying hard not to pee from laughing so hard. It's what we do. In fact, we've no doubt given up and switched to adult protective wear. What the hey, hey? It's better'n being crumpy! Um, crumpy? I rather like that. A cranky grump? Oh, now, we'll have none of that. Isn't that a fun inspiration photo?! The only thing missing is a giant cauldron of candy! Here's my Spooky Scene card. I've made it extra spooky for you by showing it in black and white with a spot of focus pocus color on the skeledude. I simply cut my card at a slope angle to resemblage a gravestone and added some ancient starry paper for a mat. I applied the K&Company stickers which are NBUS and which I've had since an after-Halloween sale last year. The skeleton came in that giant assortment of sequints from Darice you know about and the moon was fussy-cut from one of Kim's kit papers and pop-dotted. Sorry it's not very clear. I took the picture quickly before he flew back up into the tree, wobbly as a toddler. He obviously came from a nest which didn't get raided which made me happy. I love that he is still sprouting his new bird fluffy eyebrows! And what a crumpy look he gave me!! No crumpiness there! I don't think you can get any more adorable than that!! Love your spooky card and the non-spooky twins - my daughter forgot about school photo day, so I'm highly anticipating seeing the proofs! lol! Love the graveyard shaped card - perfect for the scene you created and oh my, the grinning pumpkin in the corner is my favorite! Darnell your spooky card is adorable--I mean spooky! Ooops. Love the stones. Nature can be beautiful and heartbreaking, Love the photo of the twinners. My daughter's photo day was the first week of September and they have not come home yet! Grrr! Thank you so much for joining at at the Curtain Call! I love the way you trimmed the stickers so some go off the edge - way more interest that way! And that glass gourdy thing there is so pretty! And fluffy baby bird eyebrows, and nicely groomed (for 30 seconds anyhow) twins? Perfectly beautiful way to end such a post :) Both my boys' school pictures came home with the most hilarious 'autistic boy' poses...which makes sense, but still cracks us up every year when it happens. lol! Yes! I am very proud indeed Darnell, it is a fabulous spooky card, I love it....lots! Love the cute little birdie too, glad he missed being someone's dinner. Cute card. I love the pumpkin with the teeth! The bird is adorable, especially his eyebrows! Your grandsons are so handsome and all scrubbed up and ready for school. I'm so happy you are protected from leakage. That is not a pretty sight. Seriously, it's great you are having such a good time with your sisters and wonderful that you could go and help them. You are so much fun to visit Darnell, I always get a smile and a few chuckles...thanks! FUN card, love it in black & white. Sweet little bird. Might just be part Schnauzer. Seems to be sporting eyebrows like Max's LOL!!! CUTE little twinks, think their hair will stay that perfect for picture time !!??!! What a fun card Darnell-and even spookier in the black and white! These are real spooky cards Darnell. Love the picture of the Henry and Adam, they look adorable. Your post nearly had me heading off to buy protective wear; and you're right: being crumpy really is pointless! Your card is spooky darling; your twins handsomely darling! Obviously they get their good looks from you! Your bird photo captures quite a cutie, fuzzy brows and all (perhaps that explained the 'look' - maybe he wanted some pre-photo op brow-coiffing time). Hope the fun times with your sister carry on! Thanks for thinking of us, left behind, missing you! Scheduled post = perfect!! Hi Darnell. I have some catching up to do. First off the Twinks are just too darn cute! Oh they joy they must bring you. Love your card and the way you took the photos…really liking them lately! What a fun card! Enjoy your time with your sister. Today's tip: always cross your legs before sneezing. The twins are adorable! Looks like they have been practicing with their smiles! Just perfect! Your spooky card is so cute-both in color and black &white! Ummm, wow!!! Lol !! That was TMi... Well almost too much ..!! Your spooky card is the perfect scene for over @ the curtain call !!! The graveyard effect is too fun!! Hope all is well & we'll be here when you get back, happy & dry !!! Lol ! Such a fun card, loved the picture of the bird (glad there was a little happy out of that story), and what a darling/handsome duo! You have every right to be a proud grandma. So you are sitting and drinking...sounds like so much fun for you and your sisters. Love your fabulous card and the sweet picture of the twins, so handsome. Hope things are going well at your sister's--not too much goofing off--LOL! Your card is wonderful & I adore the little birdie picture (what is he?) & your grandsons are just too cute! Oh Darnell, love your project and the birdie and these adorable boys! Okay, those sweet little twinks absolutely melt my heart! They are sooooo cute! Lucky, lucky you! Fabulous variations in the photos of your card - so cool! Speaking of cool.....ah yeah, that would be your card I'm talkin' bout! Hope you're having a great time with dear sister. Reading your post made me so thankful that my sister is only a few blocks away. Don't you work too hard....you listening to me? very cool! thanks for playing along at the Curtain Call! First of all...have to say that the twinks are looking mighty handsome! Grade 3...Oh My! Your card is wonderful...I have not made a single Halloween card yet...yikes! Love the tombstone look of the card base and the liberal tombstones sprinkled about the cute skeleton! Me again...for got to say that the crumpy bird is so precious!!! Fun card!! Love the black/white and then color....so unexpected!! That little guy- could say girl but, they're more sweet than crumpy :)) and no self self- respecting girl would let her hair go like that!! the twinks are handsome!! Such a fabulous card, and your grandsons are very handsome. SUPER CUTE! I love the slope of your card!! Ill be trying this next year for sure!! 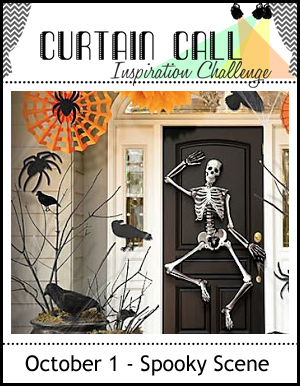 Thank you so much for joining us at the Curtain Call Inspiration Challenge "Spooky Scene!" Make sure to come back on the 15th for our all new challenge!! That is one scary Halloween card! I'll bet the boys will love it! Hope you had a wonderful time with your sisters and an easy flight home. Oh, no, I forgot to say what handsome boys they are. They're definitely keepers!